Franklin School Gets Duct Taped! During the Fall ‘Enchanted Forest” Scholastic Book Fair, Franklin School students bought over 920 books, 154% over their 600 book goal. The Principal, Mrs. Aleya Shoieb, agreed to be duct taped to the wall as their reward if they reached 600 books sold. 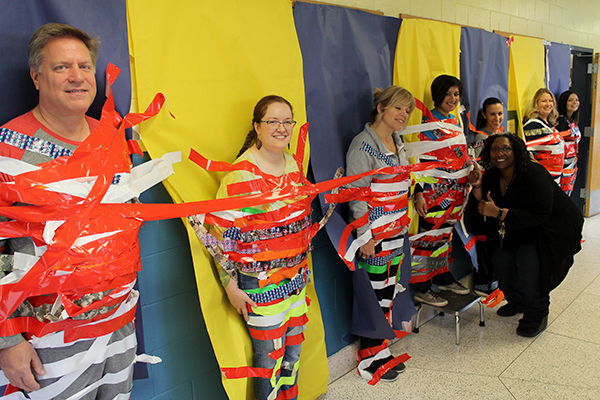 However, since they surpassed their goal, several teachers also agreed to be duct taped. The more books that were bought, the more teachers volunteered to be taped. In all, the students had the opportunity to duct tape thirteen teachers, the Principal, and Vice Principal to the wall. November 21, 2018, was D-Day (Duct Taping Day). Each student was given two pieces of tape and had a choice of which staff member they wanted to tape. (above, l-r) Pictured are Douglas Hillegas, Laura Croce, Jackie Gallo, Principal, Aleya Shoieb, Raffaella Nicoll, Alica Scipioni, and Allison Moran. In front is School Library Media Specialist, Susan Farrar.